AMAZING SHOES! A classic style with a bit of height to dress it up! The size 11 is just the right fit for my size 11 foot. I got the Myrna in black and they are so cute and functional too! Can't wait to walk all day in these shoes! Agree with another review. The heel strap too loose on the soft gold and the brown. I have the Orange and they have not been too loose. Love these shoes. I got the soft gold. It fits true to size & the gold was a perfect shade-not too yellow or too glittery - just perfect! As always, these fit well right out of the box & all day long - my go to sandal for shopping, traveling or running errands. Love this sandal! I wear Birkenstocks and Danskos a lot since I am on my feet all day. I'm now adding Kork Ease to my favorite brands. I normally wear 7.5, and the size 7 Myrna fits fine. The support is wonderful, and they are so cute. Will be ordering another color. I rediscovered Kork-Ease some years ago - when they were still being made in the U.S. The Myrna was perfect for me!! !I bought them in every color available until they fell apart. I continued to purchase them when they were made in Brazil and for the last several years from China. Sorry to share that they do not fit as before. I'm a size 9 -they are a bit too large so I use an 8. And 8 1/2 would be perfecct. My main concern is no matter which size, the heel strap in every pair (and I have about 3 unworn) slips off my heel. This has only happened with the Kork-Ease brand!!! I'm a very sad lady as I adored these shoes.and can no longer wear them. I love the Kork sole, wish you made more shoes with this sole. Very comfortable. I have 3 pairs, one pair about worn out. These are the most comfortable sandals I have ever worn. I can walk miles in them (literally) -- the cushion and support they provide my feet makes me feel like I am walking on air. The pair I have lasted 2 years of frequent use. I wish the black leather was available all year long! Please make more colors that don't have the core wedge. My brown pair is wearing out. 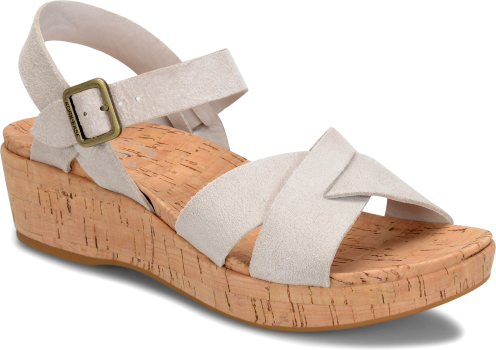 The only brown Myrna you have, has the cork wedge, I like mine with the fabric wedge much better. I love my black ones too. I get so many compliments. This shoe is very comfortable. I get compliments every time that I wear them! These shoes are wonderful!!! I packed these for a 6 week trip to Europe and they were perfect! Wore them walking at least 8 miles a day around the cities, for multiple days in a row and my feet never hurt! They are cute and as comfortable as tennis shoes for me. Plenty of arch support and they kept well even after my trip.